Continuing off from Canada Day 1 - on day 2 we woke up pretty early, even with no babies for alarm clocks, got some continental breakfast, and were on the road by 9am. We passed over the toll bridge but no cash was needed - we pay online. 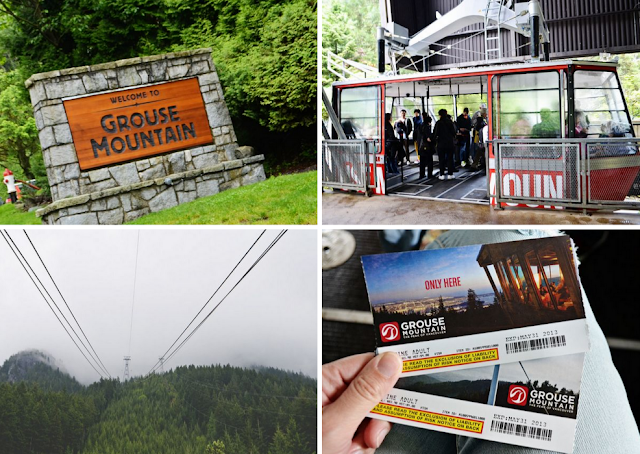 I wanted to go up Grouse Mountain first, but the mountain was covered in clouds and the whole point is to get a good view, so we opted to go to the Capilano Suspension Bridge first. 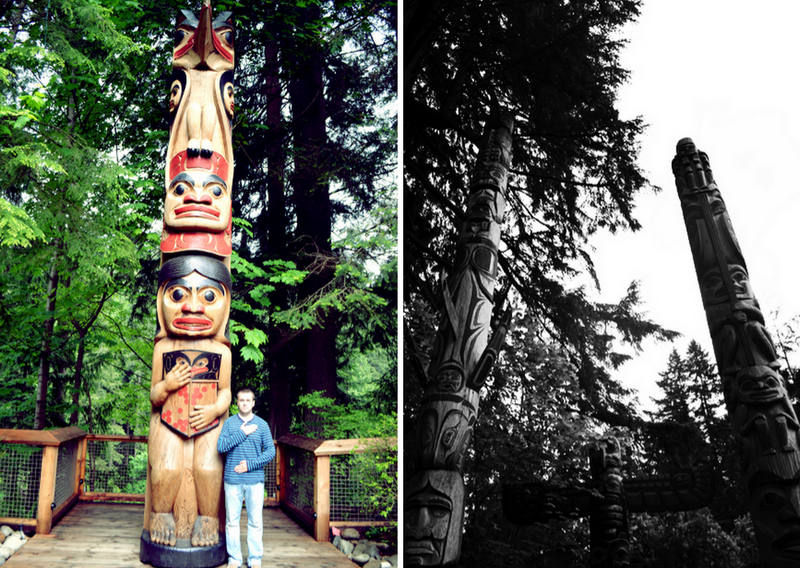 To get to the bridge you have to walk through a totem pole exhibit. The bridge through the wildflowers. After crossing to the other side we went on a nature walk. 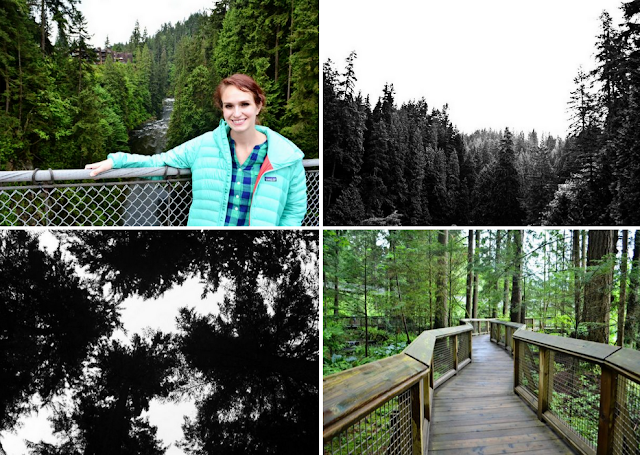 We took turns running around getting good pictures of each other on the bridge. 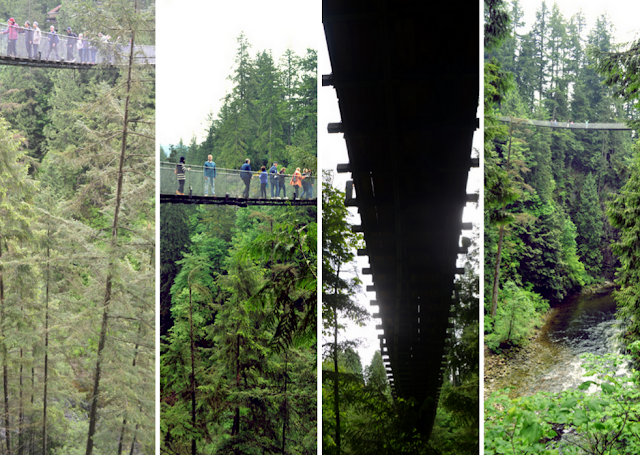 In the right picture, I'm the one in the aqua jacket in the middle, looking out over the bridge. 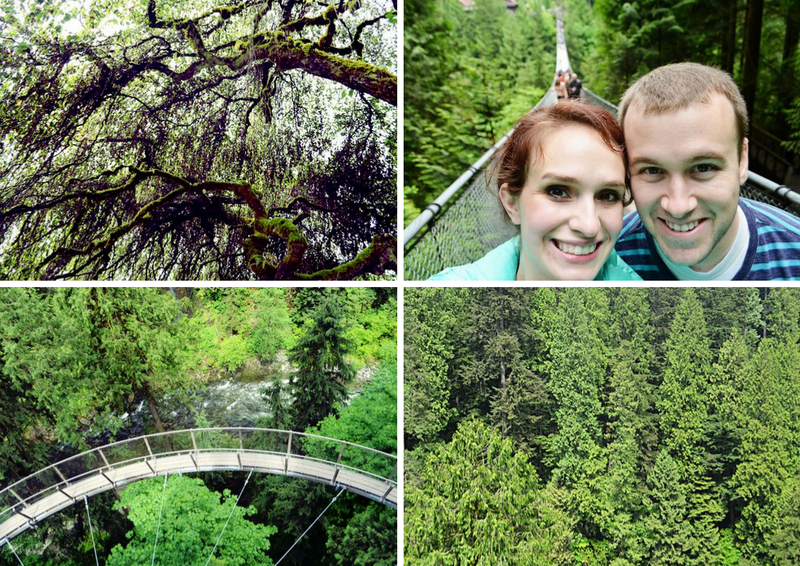 Then we meandered over to the Treetops Adventure. Lots more suspended bridges from tree to tree. Theeeen we crossed back over the main bridge and went on the Cliffwalk. How this thing stays up is beyond me and frankly a little terrifying! 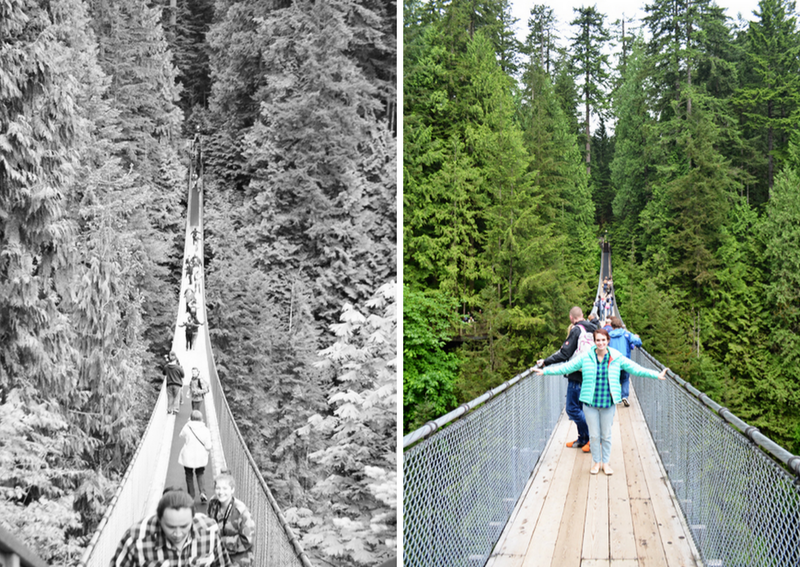 Lots of fun was had at the Capilano Suspension Bridge! Onto the next activity! 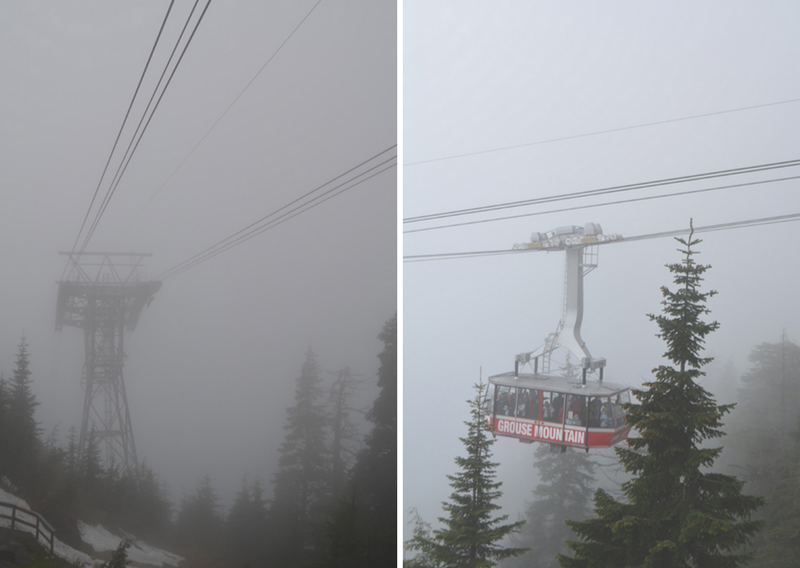 The clouds were still covering Grouse Mountain, but I wanted to go anyway, so we did. 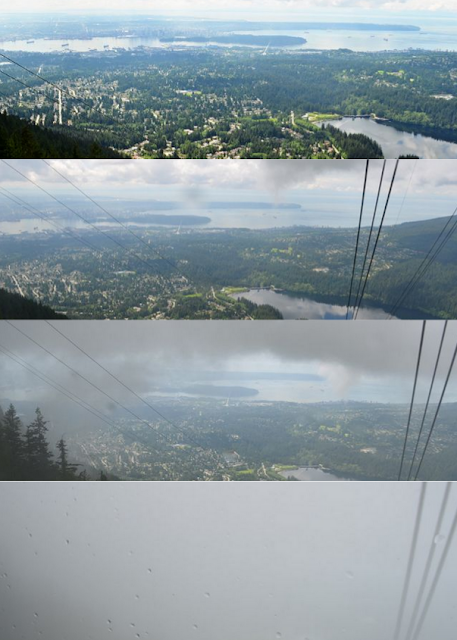 All I really wanted was amazing views of Vancouver. Pictures never do it justice, but it was a sight to behold. We could hardly see 5 feet in front of us! We went in one of the larger trams, but I think this smaller one is where Fox Mulder went up to try and rescue Dana Scully. I don't even know. We ate lunch in the cafe. They sold fries by the pound. Wowzers! It was really cold and Chris was only wearing a long-sleeved shirt and all the activities were outside, so even though we were only up on the mountain for a half hour, we felt accomplished and satisfied and headed back down. 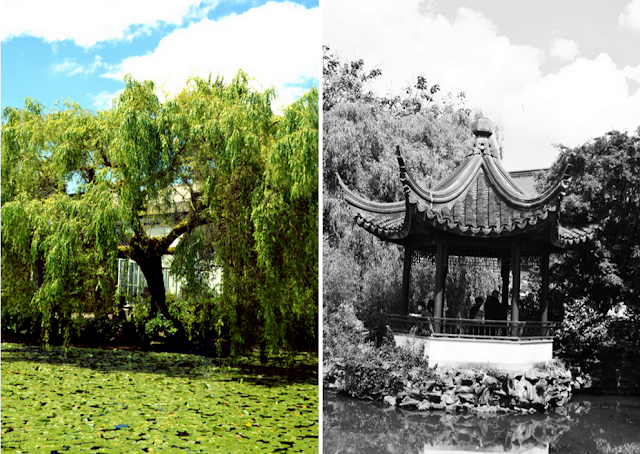 Our last stop was at the Chinese Gardens. 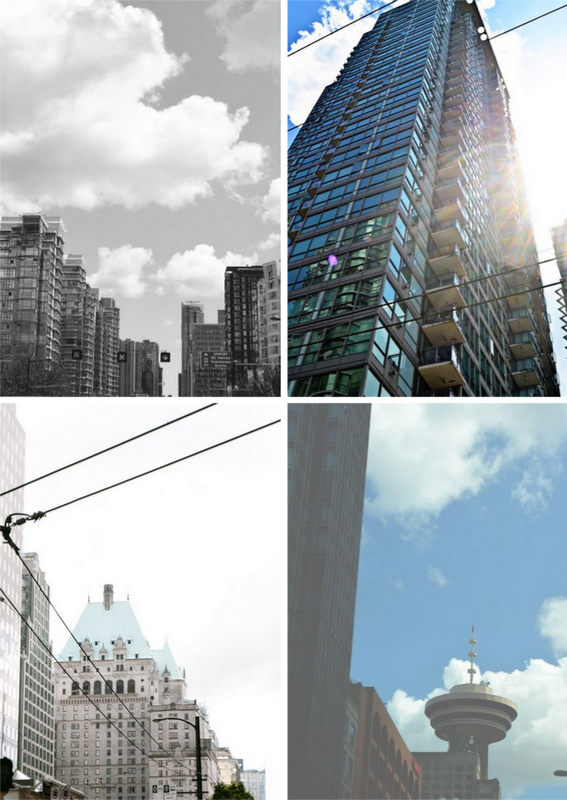 To get there we got to weave through Vancouver and see the tall buildings. 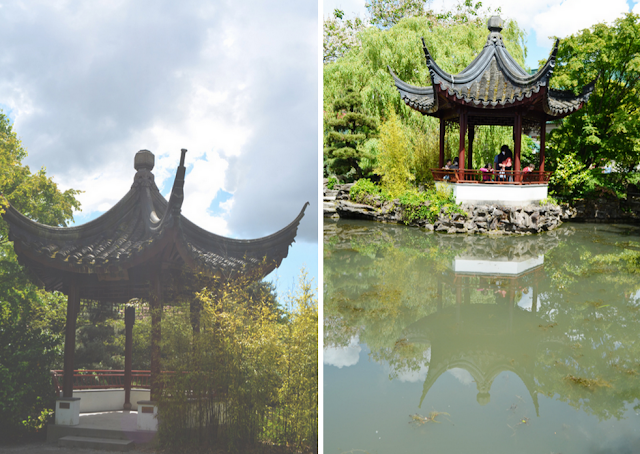 I've never been to a Chinese Garden before and it was really pretty and serene. Gorgeous photos!! Looks like a GREAT time!! 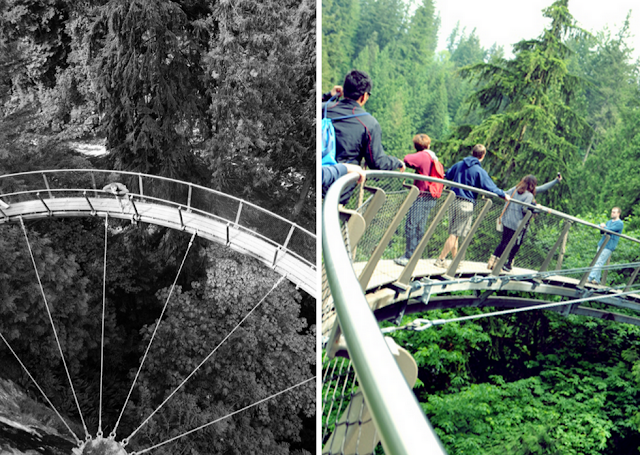 Now I want to go to Vancouver!!! You guys are having such a great time, glad you had a nice vacation. It was super fun! I'm so glad we got to go! beautiful! I would love to go to Vancouver some day! Looks like an amazing trip. 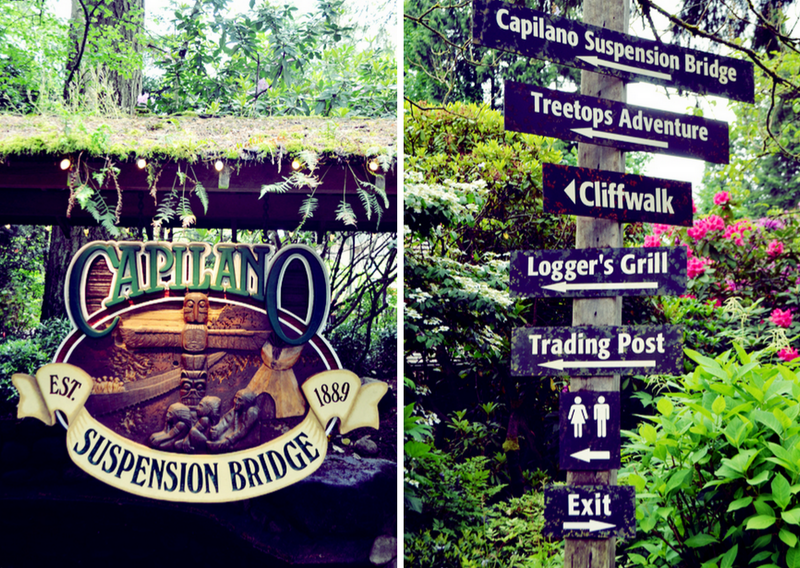 I've been to the Capilano bridge and it's such an amazing adventure. Gorgeous photos. That bridge looks terrifying!! wow! I want to go..gorgeous! Watch the $20s! The plastic makes them staticky and they cling together. Don't be handing over $40 by accident! Maybe your next trip to Canada can be to Alberta, if you think that little field was great you'll have to come see wheat and mustard fields at the end of summer - so pretty! What an awesome trip and photos! I totally remember the episode where Mulder has to ride one of those sky tram things up the mountain! How fun! That stinks that the clouds were in full force but you still got some great views! 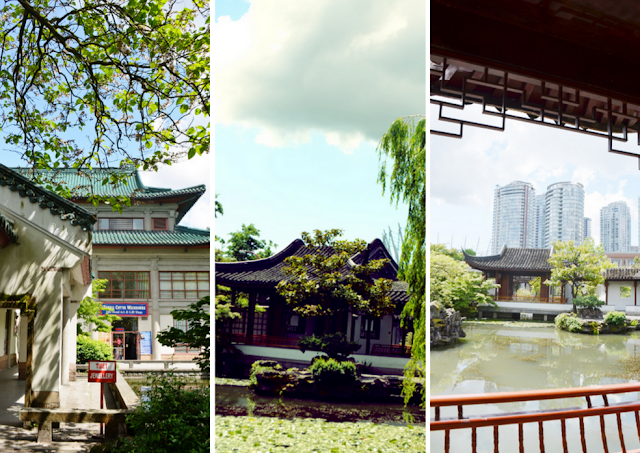 I've only been to Vancouver once but the city is beautiful! Wow!! It looks BEAUTIFUL!s ! Those pictures on the bridges are amazing! Those bridges look amazing! Now I want to go really bad! 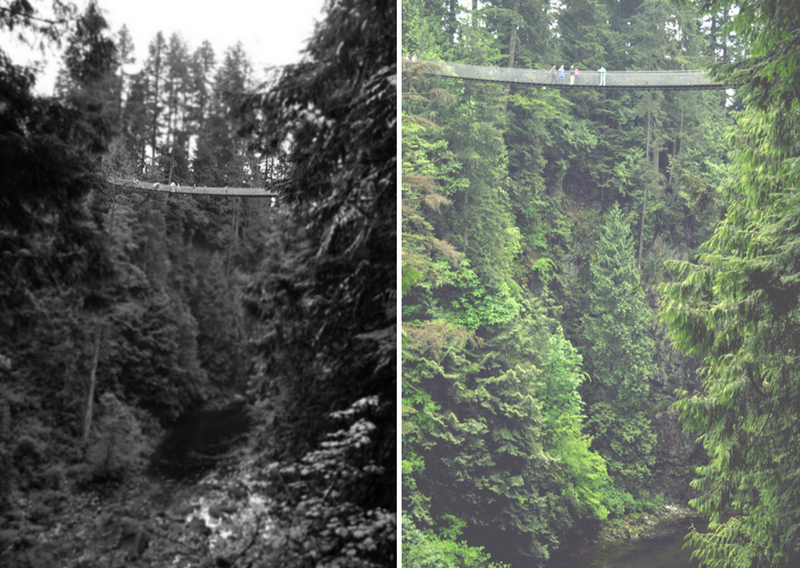 I've been on that BRIDGE--it is TERRIFYING but so interesting at the same time! GORGEOUS pictures!